Is Zimbabwe On The Brink of Civil Unrest? Finance and Economic Development Minister Professor Mthuli Ncube must address existing loopholes if his plans to introduce a local currency within the next 12 months are to succeed, economic observers have said. They said Prof Ncube faced a mammoth task to lay the fundamentals for the successful launch of a local currency within a short period. Prof Ncube last Friday indicated Zimbabwe would introduce its own currency in the coming months. Addressing delegates at the "Road to Davos" townhall meeting in Harare, Minister Ncube said Government was raising foreign currency to introduce the new currency. He ruled out adoption of either the United States dollar or the South African rand which he said would not solve the country's macro-economic challenges. Economic analyst Mr Persistence Gwanyanya said introducing a local currency was good for the economy. "The current dollarised scenario where we are having to import foreign currency for local use is unsustainable as current forex generation is not enough to meet the country's import demands, hence increased reliance on commercial facilities such as the one from Afreximbank which is believed to cost around seven percent per annum," said Mr Gwanyanya. "Suffice to mention that reliance on such commercial facilities is unsustainable," he said. He said launching a local currency would see the Reserve Bank of Zimbabwe (RBZ) assuming its traditional monetary functions. "If we introduce our own currency, the RBZ has to go back to its traditional function of inflation management and leave foreign currency allocation to the market, which is more efficient, and the only intervention will be tolerated in areas where the market is failing." Mr Gwanyanya said the current exchange system was not delivering results. "It is common cause that the current exchange rate management system where bond notes/RTGs/USD are at par is no longer delivering expected results as the bond notes and RTGs continue to depreciate (on the parallel market) on account of excessive money supply," he said. "It is clear for everyone to see that due to the depreciation in local currency, the country has largely de-dollarised and there is a high risk of re-dollarisation, which this country cannot afford. So, the way to go is to introduce our own currency and have the market allocate forex. "RBZ should concentrate on inflation control through managing money supply growth." Mr Gwanyanya warned of inflation risk if Government failed to arrest its expenditure. "However, there is still a high risk of inflation if Government fails to adjust its expenditure which is largely responsible for money supply growth," he said. 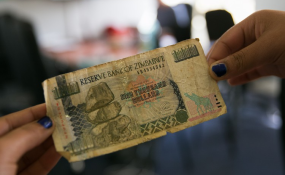 Economist and Zimbabwe National Chamber of Commerce chief executive officer Mr Takunda Mugaga said introduction of a new currency needed to be well-thought out. "My greatest fear lies in Professor Mthuli announcing a 'wrong flight plan'. To bring back our currency calls for macroeconomic convergence, which manifests itself in a narrow fiscal gap, a narrow trade deficit, as well as improving market confidence. Indicators so far are not promising for Zimbabwe to have its own currency now," said Mr Mugaga. "We need to resolve the external debt issue, land tenure issue, domestic debt, as well as re-engaging the international community due to perceived high risk in the country." University of Zimbabwe Economics Department chairperson Professor Albert Makochekanwa said a lot needed to be done in preparation for the new currency. "The baseline is that every country would want its own currency, but in the case of Zimbabwe most people have no confidence in the banking sector," he said. "The introduction of a local currency needs serious production and we are not producing enough. Let us address fundamentals first and gain confidence in our banking sector." The Zanu-PF Youth League supported the introduction of own currency, saying authorities were doing everything to ensure it was a success. Addressing a press conference at the Zanu-PF headquarters in Harare yesterday, Deputy Secretary for Youth Affairs Cde Lewis Matutu said: "We are very happy about the announcement that was made by Finance and Economic Development Minister Professor Mthuli Ncube that very soon we will be having our own currency. "It is something that is welcomed and everyone should work towards supporting this vision. The Government said in the next 12 months and as Youth League we feel it is something that should be supported. "We cannot just wake up tomorrow and have our own currency, but we know that the leadership is planning something to make sure there is a smooth landing of the currency as we go forward."